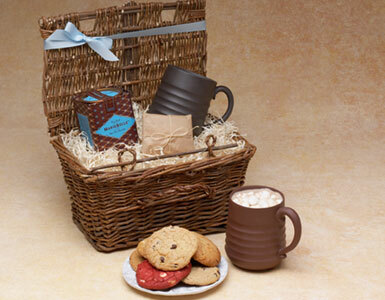 The hot cocoa basket is a divinely decadent but whimsical gift comprised of a 10 ounce tin of Mariebelle's pure rich Aztec hot cocoa, chocolate dipped Italian Biscotti, mini marshmallows, and an over-sized hand thrown coffee mug arranged in a grapevine hamper. We specialize in hot cocoa gift baskets, hot chocolate gifts, hot cocoa and marshmallow gift baskets, and hot chocolate and cookie baskets. We guarantee prompt hot chocolate gift basket and hot cocoa gift delivery to your home or office in Beverly Hills, West Hollywood, Santa Monica and greater Los Angeles area.